Patriot's Thoughts: I know there's alot of bad Police Officers out there that work against the people not for them, but there are a few good cops out there wearing a badge that get it! I use to be a Deputy and was in Law Enforcement for a long time, and this is what gives me hope when I read the negative headlines. This is what Christmas is all about giving to others! I almost duplicated this post. 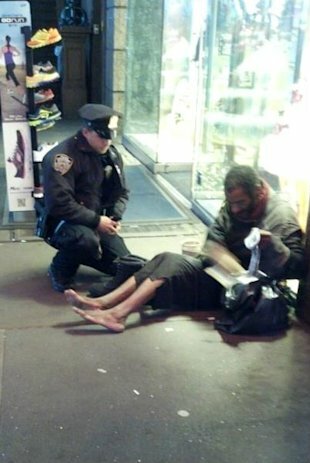 I did a search based on this title (Larry DePrimo, NYPD Cop, Buys Homeless Man Boots (PHOTO) - and came up empty - so I was going to post it - but then I got a message saying; that my post was waiting approval - I thought hmmm? - and started looking into it, and then oooops - there it was, by; J. Patriot...great story and good post! Hopefully; this will make the other shaven headed steroid abusing thugSS - trying to pass themselves off as 'peace officers', to now appear to be, exactly what they are - thugs on drugs.